The Tigris River. Photo by Charles Fred. A NASA study released earlier this week concluded that freshwater losses in the Middle East are increasing. 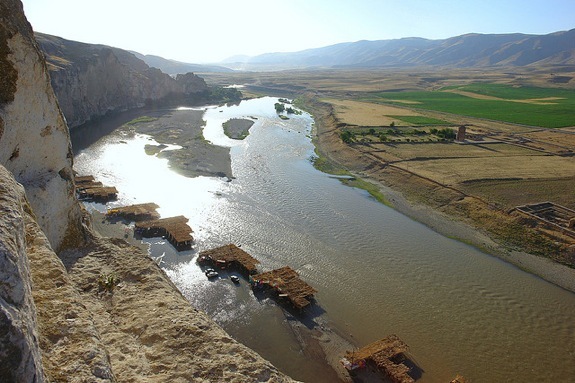 Using satellite data, scientists confirmed that between 2003 and 2010, the Tigris and Euphrates river basins (an area that includes parts of Turkey, Syria, Iran, and Iraq, lost 144 cubic kilometers of stored freshwater, an area about the same size as the Dead Sea. Most of the losses are associated with increasing levels of freshwater consumption from groundwater stores. Blogging at Foreign Policy, Marya Hannun notes that the countries implicated in the study already suffer from a high level of instability, resulting from border disputes, conflicts over Kurdish minorities, and ongoing conflicts in Syria and Iraq. Could disputes over water resources add to that list of irretraceable disputes? Concerns over resource wars have longed plagued foreign policy makers. Indeed, water itself has been implicated in several recent conflicts, though most observers have concluded that water conflicts tend to arise as a result of other, preexisting tensions, rather than serving as the primary or proximate cause itself. Nevertheless, some fear that increasing demand for water may intensify existing concerns. Already, more than 780 million people worldwide lack access to safe drinking water. The US Director of National Intelligence in 2012 concluded that the risk of conflict over water would continue to increase, as water demand would outstrip supply by 40 percent by 2030. A United nations Report concluded that 47 percent of the world’s population would be living in areas of high water stress by 2030. The hardest hit regions would be in the developing world, and particularly in the Middle East and North Africa, where Egypt, Israel, Somalia, Libya, and Yemen could all face scarce supplies. What do you think? Will future wars be fought primarily over water? Or will we find solutions to address the impending water crisis? Take the poll below or leave a comment and let us know what you think.